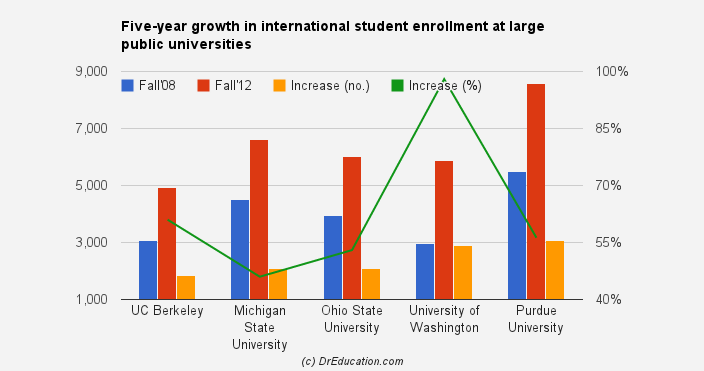 Yet another year of growth in international student enrollment in the U.S. according to the latest IIE Open Doors 2012 data. This time growth is driven by two primary factors 1) who can pay and 2) who wants students who can pay. Number of students from China and Saudi Arabia grew by 47,906 as compared to increase in total enrollment by 41,044. This means that without the double digit growth of China (23%) and Saudi (50%), total enrollment in the US would have declined. Both these countries higher ability to afford foreign education. While both these markets have common thread of growth and ability to pay, they differ in terms of level of education and sources of funding. For China, most of the growth is coming from undergraduate enrolled funded by students’ family while for Saudi Arabia growth is at English language programs funded by Saudi government scholarships. Note: IIE Open Doors has a lag of one year so, the current report reflects the enrollment of foreign students in the US for academic year 2011-12 (Fall’11). Another important driver of growth have been proactive outreach and acceptance by large public universities. Post-recession budget cuts in state universities and colleges have become an annual affair which in turn has prompted many institutions to increase their focus on international students which pay much higher out-of-state tuition fee. These public institutions have a reputation to attract and absorb large number of international students. In particular, China and Saudi are becoming attractive to many public institutions due to students’ ability to fully pay for the education. Previous Which are the Emerging Markets for International Student Recruitment?